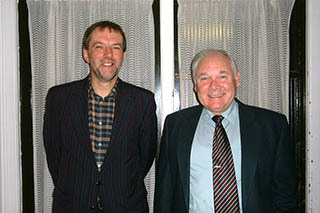 It is my sad duty to record the passing of one of The George Formby Society's most notable members. 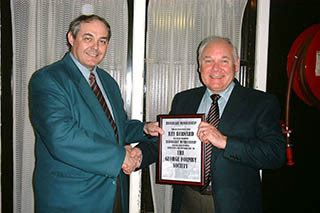 Ray Bernard was a founder member and was also one of the few honorary members of the Society. Ray was in the GFS right from the first day and reading through those early issues of the GFS magazine, "The Vellum" will illustrate to anyone just how important a member Ray was in those early pioneering days. Obviously a highly talented musician and exponent of all types of ukulele, his first major role was Musical Advisor of the Society, a role he held from 1961 to 1973. Also reading through those early magazines, it is apparent that Ray was always on hand with help, advice and tuition. 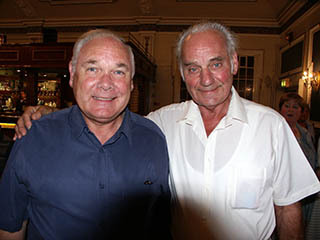 John Walley, a founder and honorary member of the GFS was a very close friend to Ray right from the beginning of the Society in 1961, John adds his own words here. 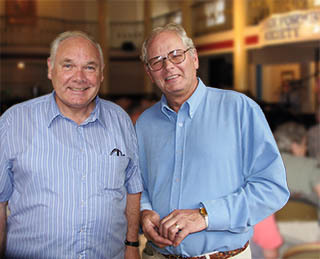 I first met Ray 55 years ago at the inaugural meeting of the GFS and to my delight discovered that we both lived in the same city, just a few miles apart. It was the beginning of a long friendship. He had two heroes – the American legend Al Jolson and our own George Formby, and had an encyclopaedic knowledge of the ukulele and kindred instruments. Indeed, at the expense of sounding a little selfish, I feel it is sad that such great knowledge was not in some way recorded so that future generations would benefit. Everyone connected with the instrument will be saddened to hear of his passing. When my own grief and sorrow have lessened a little I will feel able to write a fuller appreciation of the great man. Now our thoughts should be with Ray’s family and especially with his wife, Karen. The GFS has lost a founder member (there are now only three of us left) and a past president, I have lost a dear friend and a hero and many people will feel that loss too. On behalf of the GFS committee and every member of the Society, I extend our sincere condolences to Ray's wife Karen and to all Ray's family. Please follow this link to view a playlist of 13 clips of Ray.